Even as much as I love LinkedIn, sometimes I too get a case of the “social media doubts”. 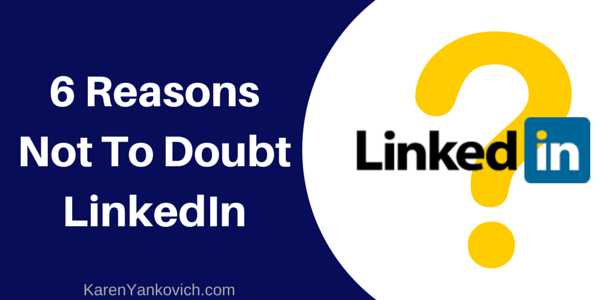 6 reasons not to doubt how useful LinkedIn is for business and careers. Success leaves clues, and that clue is telling me that I am in the right place with the right mindset. I don’t know about you, but I want to be one of those millionaires someday so if being on LinkedIn is one way to copy the pro’s then I am glad I am here, and I am glad I am connecting. There are over 39 million students and recent graduates on LinkedIn. This tells me LinkedIn is still the place to make the right connections for career success. It still comes down to “Who you know”, and I’m glad I know more and more people each day through LinkedIn. There are 332 million people on LinkedIn, spread out over 200 countries and 20 languages with 2 new users joining every second. So if I ever find myself thinking, “Where, oh where, are my clients?” I know right away, undoubtedly they are just a connection away. And if they aren’t on LinkedIn yet, they will be soon. This stat shows me my connections are active and ready to receive what I have to say, connect with grand new plans for the future, or share my stuff, which is always the hardest part of social media: getting someone, anyone to share our stuff. Users who post long-form content on LinkedIn typically have 1,049 connections. 59% of LinkedIn members have never worked at a company with more than 200 people. That means that LinkedIn is for us, the little guy! It’s for the student or business just starting out, entrepreneur building and extending their reach, the small business owner adding employees, and the millionaires watching their small fortunes grow. If you are looking for more LinkedIn stats, Click here for the full article where I got the above tidbits. If you are in need of a pep talk and some good old-fashioned smart LinkedIn answers, click here to join my LinkedIn group. It’s free, it’s fast, and it will make you feel better about navigating the world of LinkedIn. Don’t go it alone – you really don’t have to. 6 more reasons to get off the fence and get to know that platform. Thanks for the encouragement, Karen. Yes, knowing which social media channel to pursue is such a personal decision. (So many choices, so little time.) I like to ‘rotate’ my efforts and see where I feel the most traction. I think it’s really important to know where our people hang out and, more importantly, where WE thrive. Thank you for providing us so many LinkedIn stats, Karen. Thank you for all of those interesting statistics! Social media is an excellent way to grow any business and make new contacts. Great perspective…what are we afraid of, really? tell me more about “long-form” content, karen. are you referring to the posts/articles that i’m suddenly seeing on LinkedIn? (perhaps they’ve always been there and i just hadn’t noticed before,) thanks for your always informative suggestions. Holy Stats, Batman! These were really great, Karen. I had no idea. Note to self: Get thee back to LinkedIn. Pronto!